This is a control deck with a combo lockout. 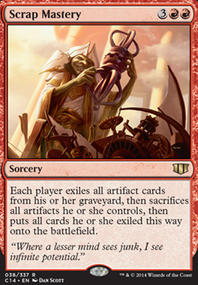 It uses ramp on Turn 2 to ramp a Turn 3 Gifts Ungiven for the “Unburial Package”, “Wrath Package” or Value as needed and has a lot of removal to keep the board under control. This deck runs a lot of ones and two ofs to facilitate Gifts Ungiven unique name requirement in case the “Unburial Package” won’t win the game on turn four and I need to use it for value or Wraths. The deck is quite resilient to grave hate even though it likes to reanimate as the ramp and removal allows you to get to the late game to hard cast your reanimation targets. Historically 4c gifts have relied on a discard suite to make it to the late game and some have tested counter magic to some success. Counter and Discard magic are proactive ways to control the board, I have decided to go with a reactive form of control, that is I aim to control the board via removal spells. Discard and Counters can handle a lot of threats but are poor for regaining control of board states and dealing with resolved or recursive threats. 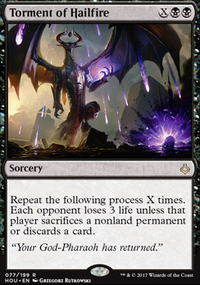 Discard also has the drawback of being a Turn 1 play which leads to a higher number of Fetch+ Shock so you start at 17 or less life. With discard you don’t necessarily stop your opponent from playing a threat on their turn, merely changes which threat. Removal allows your opponent to spend their turn playing a threat which you remove, or you wrath the board netting virtual card advantage. The deck is very resilient to spot removal, all the creatures get value on entry or are tokens with the only exception being Iona, which locks out a color likely locking out that removal anyways. The small creatures that could die to push or bolt are creatures that would die on chump mode anyways. And my planeswalkers make 2/2 tokens to go along with my lingering souls spewing out 4 1/1s. The lack of good targets for bolts and push means those are poor draws. If you add any creatures you need to make sure they are resilient to removal or are hexproof to prevent turning on their otherwise dead removal. Champion of Wits Is a great way to redraw starting hands where part of the unburial package is in hand or smooth awkward draws. While Catalog is better for that purpose, Champions ability from the grave is why I run him. You can pitch to Collective Brutality , or bin him from Search to Azcanta later he can be eternalized as a 4/4 that Draws us 4 cards and pitches 2 of our worst cards allowing us to take a dead draw turn to refill and sculpt our hand while putting out a 4/4. Liliana, Death's Majesty Is a 5 mana reanimate spell that isn’t a dead card when we lack a reanimate target in our graveyard. She can fill our graveyard for us to find our reanimate targets or Lingering Souls / Champion of Wits while making zombies to block or attack. Theoretically she can ultimate to do a mostly one-sided wrath but that is unlikely and has yet to be used in my games. Sylvan Caryatid is the premier ramp piece for this deck. Its’ hexproof is invaluable guaranteeing we will have 4 mana on Turn 3, it blocks 2 power creatures all day. It allows us to unburial through a LOTV as the edict will just eat the Caryatid. It also enables our greedy mana base (we have double color requirements for everything but blue). It’s being 2 CMC means we don’t have to shock/fetch to play it on curve like discard and its ability to block the majority of the current metas’ creatures means it saves us a lot of incidental damage. I checked Sylvan Caryatid ’s blocking ability against the 50 most played creatures in modern (https://www.mtggoldfish.com/format-staples/modern/full/creatures)(4/17/2019): Sylvan Caryatid can block and survive 22/50 and chump 15/50 for a Grand Total of 37/50 or 74% of the most commonly played creatures in modern. Almost every creature it can’t block has flying which is why I have. Stirring Wildwood is my man land as nearly every creature Sylvan Caryatid can’t block has flying so its reach helps with Spirits and phoenixes. It also survives a bolt unlike creeping tarpit, though Fatal Push can still be an issue. Liliana of the Veil While LOTV like discard is a standard part of normal 4c Gifts I am not running her in my list. With my ramp package allowing me to jump to 4cmc on Turn3, LOTV would compete with wraths and gifts on that pivotal turn. Her edict is nice but in the current meta of hasty, recursive threats is underpowered. Without the discard suite to back her up a single discard starting on turn 3 is honestly not that powerful. In addition to all of the above her double black requirement is a real tax on the mana base that would otherwise need double white and/or a blue for wraths/gifts. There are only 2 main deck piles, you can lock the game if you know the opposing deck and have the upper hand or grab the wraths to ensure a wrath next turn. This allows you to force 2 cards into your grave at instant speed. So you cast Gifts Ungiven at their end step, then on your turn you flashback Unburial Rites to reanimate your desired fatty. The sideboard is where we can tailor our packages to different matches. 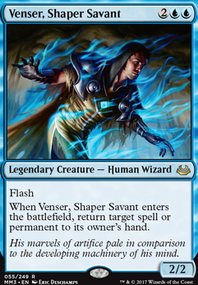 Snapcaster Mage and Noxious Revival means any one card can be accessed. As they either give you the card outright or you make it your next draw by putting the card on top with a Noxious Revival or Snap+Noxious. Assemble a Troll Worship lock from the board, while only giving your opponent at best 1 turn to try and prevent the lock. Until and unless our opponent can remove either our hexproof creature or our four-mana enchantment, we cannot lose the game to normal damage effects. This pile may also help shore up the burn matchup but burn has not been in my meta recently to test with and Iona locking is probably better anyways if you aren’t afraid of a random Path to Exile getting her. 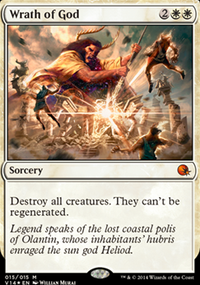 Allows you to destroy a nonbasic land and get rid of all copies of it not in play, just like Crumble to Dust . Helpful for Valukut and Tron based decks. From the board you can bring in Loam and Crime to combat control by stripping their hand so they can’t counter your removal. You can also grab Bojuka Bog to arrange a grave lockout by playing Bojuka Bog every other turn as you must Ghost Quarter your own bog and use loam to get it back. The deck is a reactive control deck that uses removal to control the board and leverage a bevy of different finishers. This wide swath of finishers are good in different matchups but can be accessed via the power of Gifts Ungiven . The most common lines it uses it to reanimate an Iona, Shield of Emeria or Elesh Norn, Grand Cenobite as soon as T4 or to grab all 3 wraths and a Lingering Souls to wrath on cue. Everyone in the meta is packing grave hate though! This deck has no issues with hard casting it late game finishers and the abundance of removal it uses helps to get to the late game where the midrange threats like Baneslayer Angel / Gideon, Ally of Zendikar can pose a threat or a hard casted Iona/Elesh Norn is game. Where does the Deck Struggle? The worst matchups for 4c Gifts is any Tron Variant. The removal sweet is geared towards dealing with creatures, and the unburial targets don’t line up with Tron’s threats. The odds of winning against Tron with this deck game 1 is so bad that you are best to not show what you deck you are on and hope to get the post board games. Where does the deck thrive? The best matchups for this deck are low threat density decks, small creatures and decks that rely primarily on a single color. Small Creatures and decks that rely primarily on a single color will lose to a T3/4 unburial while low threat density decks will have a hard time keeping their threat out for more than a turn. 4c Gifts control has been around for a long time, so what’s changed? I want to try this deck! What should I know about playing it? Like all control decks, you need to be aware about play speed to avoid going to time as this deck has the uncanny history of going to game 3 90% of the time. The fact that its 4 colors makes mana base management a challenge to not get color screwed, which is where Sylvan Caryatid shines. Our idea Turn 2 play is a Caryatid or a Search for Azcanta Flip. Most often you will gifts for wraths to reset the board and should only go for the unburial when you know if Iona/Elesh Norn will win the game and won’t get countered/removed. My deck in its current build has 6 “Packages” that are a preset of cards that you gift for specific reasons/matchups, most of which are in the sideboard. Main deck only has the Unburial and Wraths, but value piles are always an option. Why should I trust you about 4c Gifts? I started playing Gifts Ungiven in late 2015. I moved to this 4c Variant late 2018 and have been actively testing and tweaking the deck since. This Deck has placed 3rd and 4th at my LGS 2 small tournaments during that time. Overall the Deck has a 52% (89 game wins 83 Game losses) game win rate across its iterations (which has changed drastically from the first version in November2018). I have played against 31 distinct decks, probably more as my log doesn’t have deck names for the early logs as I recently started tracking the decks performance and pulled my records from Planeswalker Points.